Tier 1 Solar Panels with German owned inverter. Click here for case study on this exact system! Click to Enlarge and Study the Jinko Solar Panel Test results. All this and our famous 10 year Workmanship warranty on install! Are you after a cheap deal on a Solar System installed around the Gold Coast and Brisbane regions using the German SMA inverter and Jinko – High Quality Tier 1 Solar panels? We are now pleased to announce that we can install 6kw (22 x 275watt) Jinko Eagle solar panels with the Fronius Primo Inverters. Benefits of the Fronius Inverter are a 10 year warranty on the inverter, and WI-FI enabled without the need to purchase additional parts! You can read our Fronius inverter review here. We Have the answer for you. We have just secured containers of Jinko Panels at great pricing and happy to pass the savings on to customers. Customers in Brisbane and surrounds have increasingly been on the lookout for Tier 1 Solar Panels. 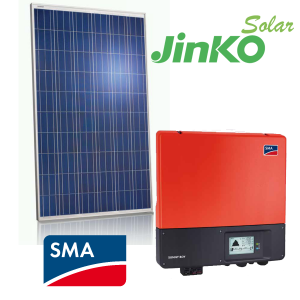 We are selling Jinko Solar Panels at a terrific price coupled together with the German SMA inverter! You simply cannot get a better performance system with excellent pricing and warranty to match. If you want to take advantage of this Tier 1 solar panel package please fill out our Brisbane solar Quote form, and let us know that you want Jinko solar panels.